Skolt Sámi belongs to the group of Eastern Sámi languages. The variety of dialects and many historical factors probably contributed to the fact that a standard written Skolt Sámi language was not created at the same time when the written language of North Sámi, for example, was developed. The translation of the New Testament into the Paatsjoki Lapp dialect - in the Cyrillic alphabet - by Konstantin Tsekoldin, a Greek Orthodox priest who was active in the Kolttaköngäs region - was one of the first attempts to create a written Skolt Sámi language. Researchers who travelled in the Petsamo region in the 1920s and 1930s collected place names, for example, in Skolt Sámi, developing an ortography for this purpose. In 1958, a Skolt and Kola Sámi dictionary made by T. I. Itkonen and stories and narratives concerning beliefs were published in Skolt Sámi. Among the Skolt Sámi themselves, the language remained a spoken language for quite long. The first systematic attempts to develop the Skolt Sámi written language and ortography appeared as late as the 1970s. Even then, the development was hampered by the fact that the Skolt Sámi who had moved to the present Finnish territory after World War II came from three Skolt Sámi villages and spoke, therefore, different dialects. The Skolt Sámi of the Paatsjoki and Petsamo Lapp villages were reluctant to recognize a written language that was exclusively based on the dialect of the Suonikylä Lapp village. In 1973, A Guide to the Skolt Sámi Language ("Koltansaamen opas") - made by Mikko Korhonen, Jouni Mosnikoff and Pekka Sammallahti - was published, and in 1975 came out the first ABC Book, edited by Pekka Sammallahti. After this, the written language has been developed through the publishing of dictionaries, books and teaching material for different levels of education. At first, the Skolt Sámi language was taught in the Sevettijärvi elementary school and occasionally in the elementary schools of Nellim and Akujärvi. Today, the language is also taught in the lower and upper secondary schools. A Skolt Sámi grammarbook has still not been published. Reindeer herder Jouni Moshnikoff and Educational Councellor Satu Moshnikoff from Sevettijärvi have worked hard for developing Skolt Sámi teaching material. In 2002, an illustrated dictionary - translated by Katri Fofonoff - was published in Skolt Sámi. The weekly newscast that is broadcast in Skolt Sámi by the Finnish Broadcasting Company YLE's Sámi Radio has contributed a great deal to the survival of the language. The Skolt Sámi newcasts were edited for a long time by Elli Rantala, a pioneering Skolt Sámi journalist. The language has also developed in the ecclesiastical sphere with the support of the Finnish Orthodox Church. For decades, there has been a special committee working on the translation of church texts into Skolt Sámi. The first translation to be published was a book of church songs - a book of which a revised edition has already come out. 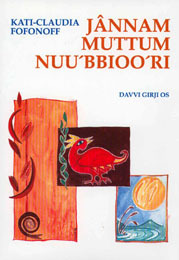 Poetry in Skolt Sámi: Kati-Claudia Fofonoff´s poetry book was published in 1998. Davvi Girji OS. The next book to be translated was the Gospel according to St. John. In 1999, a handbook of the Orthodox faith and, in 2002, the liturgy of Johannes Krysostomos were published in Skolt Sámi. The translation of ecclesiastical texts has, to a great extent, been carried out by Cantor Erkki Lumisalmi, who belongs to the travelling clergy of the Orthodox Church and lives in Ivalo. He is a Skolt Sámi by birth. Klaudia Fofonoff's Skolt Sámi poems have been published both in the form of books and casettes. Klaudia Fofonoff has also recorded stories and narratives in her own language. Leu'dd poems that were once recorded in Skolt Sámi were later published - together with the texts - in the form of a CD ROM.